The Mask of Zorro is simply the best movie that I have seen all year! This movie has everything: a great story, superb acting, intense action, wonderful music, and at times it is extremely funny. It is heroic and inspiring. 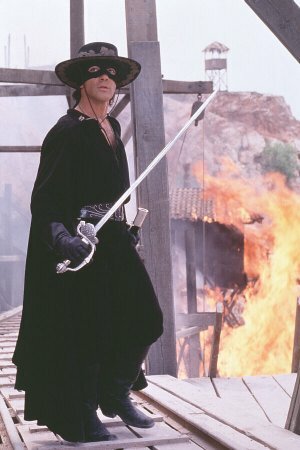 I have heard reluctance from some of my friends to see this movie because Zorro has been done before. And superheroes have been done before. But in my opinion, this one stands tall as one of the best if not the best of those types of films. And as I stated earlier, it is certainly the best movie of the year. At the start of the movie, Anthony Hopkins is Zorro, protector of the people in what is now California. Years later, Don Diego de la Vega (Hopkins) takes it upon himself to train his replacement, Alejandro Murieta (played by Antonio Banderas). Along the way, there is much of everything you would want in a movie: action, humor, honor, retribution, and love. 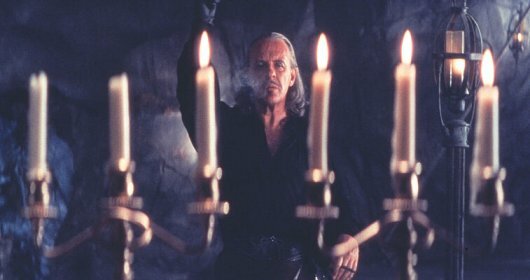 Hopkins was brilliant in his role as Don Diego de la Vega/Zorro. This is not surprising after he has mastered such roles at that of Hannibal Lecter in The Silence of the Lambs. In this movie he is simply inspiring as the wise teacher of Banderas. And Antonio Banderas was no slouch either. He is transformed from bandit to gentleman as he learns the keys to being Zorro (many of which are mental, not just swordfighting). 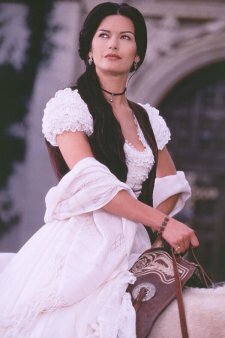 And what can I say about Catherine Zeta-Jones? She is perhaps the most beautiful woman that I have ever seen on screen and is a wonderful actress as well playing Elena, Don Diego de la Vega's stolen daughter and Alejandro's love interest. You can gaze upon her to your right. To get the actors in shape, director Campbell ('GoldenEye') instituted a rigorous training regimen prior to the shoot. "It was really a glorified boot camp," shudders leading lady Zeta-Jones. "Four long weeks of dancing, choreography, horse riding, voice, and swords." And still not everything went according to plan. "There's this chaotic scene where Banderas fights 10 soldiers," says Campbell, "and by the time we wrapped the scene, he had damn Band-Aids everywhere and blood running down his hands. I don't think he had a finger left." One other great aspect of this film is the humor. There are several places where something very funny is inserted (such as a baby laughing) or done in the movie. These scenes were not really needed as far as the storyline goes, but at the same time they truly enhances the entertainment aspect of the film making it truly enjoyable to watch. As a final note, the musical score by James Horner (who did Braveheart and Titanic) is just great. It captures the soul in its own Spanish style. And mentioning The Mask of Zorro along with Braveheart and Titanic in the same sentence is not something that should just be done when referring to Horner. This really is a great film. This is one of the most entertaining movies ever! How would you rate the movie The Mask Of Zorro? There have been 49658 people to visit this page since Fri, Jul 31, 1998. And you are the first person to visit this page today!